Jagielka’s goal – A Leighton Baines corner is headed in at the back post by Jagielka, who is climbing on Vertonghen’s shoulders. The header is angled downwards and goes through Lloris’ legs. 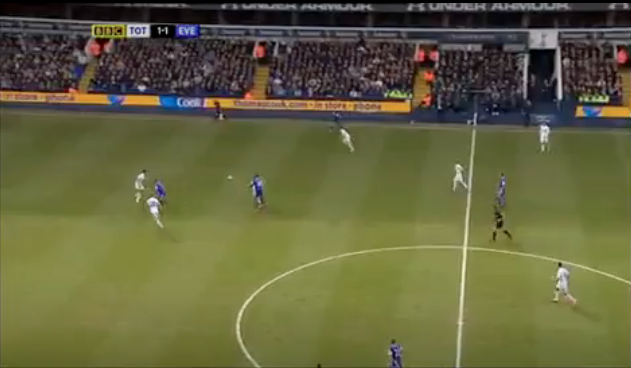 Baines’ corner is aimed towards Jagielka, who is marked by Vertonghen. Vertonghen is caught flat-footed, and doesn’t get up to compete. However, Jagielka clearly climbs on him with a hand on each shoulder. The referee has a perfect view of the incident. The ball is headed downwards and, unfortunately for the goalkeeper, goes through Lloris’ legs. Mirallas’ goal – As Anichebe brings the ball down and plays it wide to Mirallas, our defence seems to simultaneously switch off. Mirallas drives at Caulker and smashes a low shot into the corner. As Everton fire the ball forward, Anichebe drops off Dawson to collect the ball – Dawson is unsure whether to go with him, as Parker is covering that part of the pitch. Notice Vertonghen ball-watching, with the eventual scorer, Mirallas, behind him (blended into the dugout!). Anichebe lays a first-time pass off, and Mirallas is already moving – bursting past the static Vertonghen, who is far too far away from Caulker regardless of not knowing where Mirallas is. 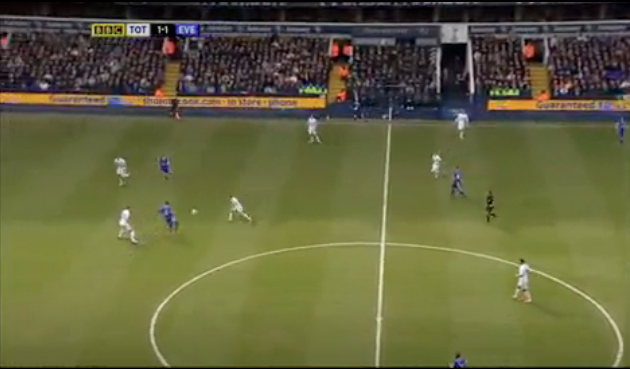 Mirallas has space to drive into, and Caulker is forced to back off, with Jelavic making a dart in behind Dawson. Parker attempts to make up ground, but is not going to catch Mirallas, who toes the ball beyond him, and has Caulker on the back foot. …before turning back outside and getting a shot away from an acute angle. 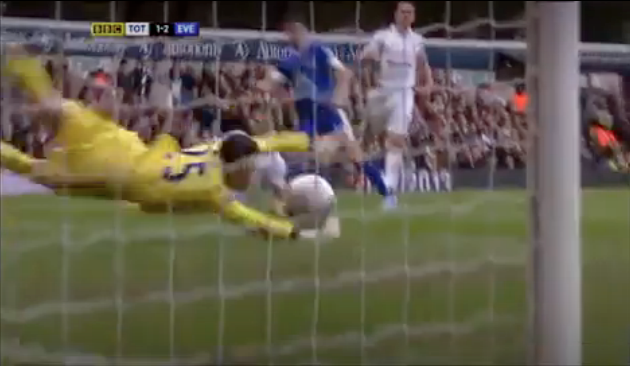 Lloris is narrowly beaten by Mirallas’ fantastic strike – across the face and into the far corner. Our 4-1-4-1/4-3-3 hybrid arguably was the cause of our first goal, and Everton’s second. We created our opener with Vertonghen making a superb run to get beyond the narrow wing-forward, Sigurdsson, and putting a dangerous cross into the box. Vertonghen rarely replicated this for the rest of the game but, ironically, for Mirallas’ goal, he is too advanced and too far from Caulker. Along with this, a lack of communication between the holding midfielder (Parker) and centre-back (Dawson), leads to confusion – Dawson thinks that Anichebe has drifted into Parker’s space, and drops off, whereas Parker is too far advanced to affect play and ends up chasing shadows. There were positives from the 4-3-3 though – our ball retention was generally good, with Holtby putting in a tidy shift and recycling the ball well. He also dovetailed nicely with Dembele, who had greater license to carry the ball forward, knowing that he had two men behind him. We also saw strong performances from Adebayor – who led the line admirably – and Sigurdsson – who was tenacious and creative. Walker took advantage of Dempsey’s tendency to tuck in by providing a constant outlet on the right, and it was arguably his best attacking performance of the season. Either: 1) AVB's a moron 2) Dembele was injured/exhausted Basically, everyone has to chose one or the other. I'm guessing most will use their current opinion of AVB to make that choice! Dembele was subbed as we needed to get another passer in to the midfield zone in order to move the ball even quicker against an Everton side who were dropping off and playing on the counter. Dembele likes to dribble to his left with the ball at his feet. Although he is very effective at doing this, carrying it like this is slower than passing - he was also running in to two or three Everton players with Heitinga and Gibson shielding the Everton back four. Huddlestone's introduction immediately saw us quicken the tempo and the pace at which the ball was moving forward. Then AVB brought a third passer in Carroll in to this central zone for Scott Parker, as we went all out for a winner. This was the match where I finally give up on AVB. I thought the team selection and tactics were poor but taking off Dembele and having Dempsey do less than nothing for 90 minutes,(he kept breking up our play) was beyond belief. No BAE, no attempt to created width in the absence of Bale and Lennon. Townsend and Rose out on loan, I've really had it. With some reservations I thought Holtby, Gylfi, Ade and Dembele played pretty well but were horribly handicapped by the formation. Holtby playing centrally just emphasised that he is not a wide player. Hudd's cameo points out the stupidity of denying him the chance to gain fitness in the Europa league. Ditto Carroll and Livermore. I despair. Oh and your analysis of the first goal just confirms what we were all saying throughout the match 'Marriner's a cheat'. Windy once again you have summed up our lack of defense in a professional manner. But you have ignored me on many occasions on a subject that i am expert at spotting energy abuse. What you are witnessing is teams taking advantage of our Thursday game. How they do this is by legal substances once banned 2005 caffeine and ones that are banned Ephedrine mixed with Aspirin. You once said so everyone is taking these drugs why not Spurs. The answer to this is no because our players don't move in a manic unit don't defend in numbers and look ill and gaunt. This is the evidence Mireles went of injured yet i knew two things one he would play and two he would score both came true. Secondly Everton have conceded more goals in first 15 mins and won more points from losing positions along with Utd. I live not far from Liverpool and Manchester and i no its rife. The team reported in 2008-9 was Liverpool there nickname was twofold the Duracell bunnies wind them up and they run all day and the come back kings. They have not reached those heights since they finished second. I wont bore you anymore but trust Kolo Toure was not alone and he got caught because he was sub. This is why i wanted Lyon to knock us out because of this extra energy being swallowed. Yet again we get caught out on first goal by not having a man on far post, goals like that are so avoidable why haven't coaching team copped onto it. 2nd goal I thought Dawson should of gone for ball or just dropped off but he got caught inbetween doing neither as for parker he's starting to really get on my nerves running around clueless. If they're on the post, they're not somewhere else marking someone (or a zone). It's not like you're allowed to bring on an extra player to put on the post. Having said that, would Lennon normally be on the back post? Parker needs controlling by the manager. If he must play he has to be told to sit, not try going forward and just pass the ball simply to someone close to him. Leave creative forward play to those that can and protect the defense. That is all he is capable of as we keep seeing, he's doing my head in too. I agree, but the problem with that is as soon as the other team realise that's what's happening they know they can just sit off Parker, cut off his obvious passes and wait for him to flail it forward aimlessly or pass backwards.